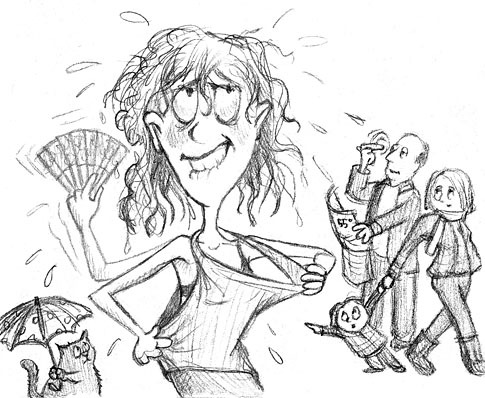 Living Lindsay: Darn Hot Flashes! i was off my progynova pills for a while... about four days. HOT FLASHES came to me! i'd get them at odd times. all of a sudden i feel so so hot its like am right in a furnace! jeez! thats not a nice thing to feel. i bought my pills again though. they are quite expensive you know. spending about Ksh.1,200 ($15) per month is no joke. not like i can't afford it, its just that i had stuff to do with the cash and needed it. then the prices were fluctuating and i being the economic one wanted to save the buck! my deed poll is not yet through. need cash to pay the lawyer. but am hoping things go well. hopefully by end of month or mid next month i shall have it and eventually apply for a passport. i don't have one yet. life is good. am really enjoying it. don't worry. someday i shall be able to share even more about my not-so-amazing life! Now you know what women going through menopause feel. :) I had a bit of that before my surgery because I had to be off hormones for three weeks. Thanks Veronica for always commenting.. I'm just waiting for one or two things to sort out so I can be able to fix things. I feel your pain on coughing out that amount of dough. I have to painfully pay between 1,200 and 1,500 for my contacts every month - a price to pay because I HATE wearing my glasses (have you been in the Nairobi heat lately?? Imagine being under such warmth with a package on your nose!!). Always good to know what progress you're making, Linds. GO PASSPORT! !